Well not really, am at the moment sitting in London writing about a Mexican bread. Cemita originates from city and region of Puebla in Mexico. It refers to the bread as well as the sandwich itself. 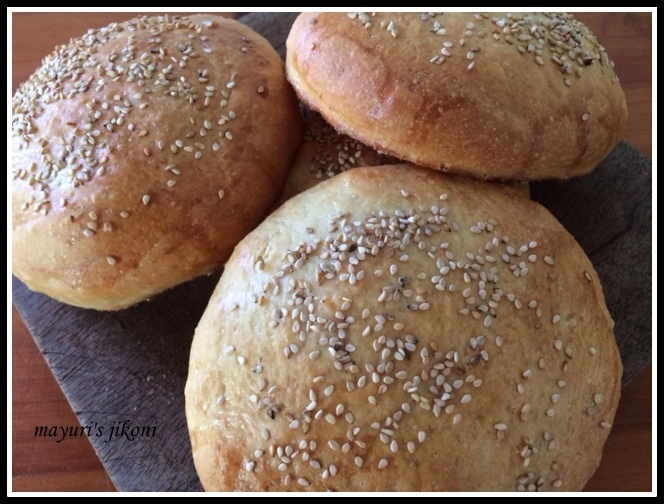 The bread bun or roll is made with flour, fat and egg and has sesame seeds on top. It has a brioche like texture, crispy on the outside and soft and spongy inside and slightly sweet. Found as street food in many cities and towns of Mexico, as well as the streets of New York and Los Angeles. The sandwich typically contains a white cheese, avocado,meat, onions, salsa and papalo herb. Papalo is very much similar to coriander. Some bakers added the herb to the bread whereas some added it to the sandwich. Apparently the cemita found outside Mexico is not the same as the authentic stuff. Well, I’m not an expert on this subject. All I can say is when the August challenge on We Knead to bake came up, I happily baked the cemita rolls and made my version of the sandwich with it. I added avocado, lettuce, tomatoes, salsa and coriander to the sandwich. We enjoyed the bread thoroughly. Here is the recipe for the buns/rolls. Try it out, its really a different kind of roll/bun. As the dough was fairly sticky, I kneaded it by machine. I was not able to take a good photo of the sandwich I made because it was night time. Mix the flour, salt, sugar and yeast into a big bowl. Add the cream, milk and lightly beaten eggs into the flour mixture. Mix everything up with a spatula and let it rest covered for about 10 minutes. Let the machine knead the dough for about 5 minutes. If it is too sticky, add a little bit of flour but not too much. Grease the bowl and hands with some butter. Shape the dough into a round ball and place it in the bowl. Cover the bowl with a cling film and let the dough rise in a warm place till it is 1½ times its original size. Mine took about 3 hours. Dust the work top and knead the dough gently. Cut the dough into 6-8 parts. Cover the dough pieces with a tea cloth and let them rest for about 30 minutes. Lightly dust the work top and roll each part of the dough into a ball. I then pressed it gently between my palms to give it a flattish wide shape. Place the dough on the greased tray. Repeat step 12 with the remaining dough parts. Brush the tops with beaten egg or milk. Sprinkle a generous amount of sesame seeds over the buns. Sprinkle some coarse sea salt. Bake the oven for 15 minutes till the tops are golden brown. Remove the buns from the oven and let them cool on a wire rack. Serve as a sandwich with your favourite filling. If the dough is sticky and cannot be worked on, leave it for 15 -20 minutes. It becomes a bit more glutenous and its easier to work with. Your oven temperature may vary so use either 200° or even 180°C. To make eggless buns you will need to add more milk. Looks delicious. Baked to perfection. Cemita buns looks absolutely incredible and prefect to prepare a sandwich with. Lovely buns there Mayuri, feel like making some again.